Kyo-no-oto fountain pen inks are made in Kyoto Japan. They are crafted according traditional Japanese dyeing techniques. The Kyo-no-oto ink colors are traditional Japanese ink colors that has been used since Heian era, roughly 1000 years ago, which are the expression of its rich history and profound culture for a long time. 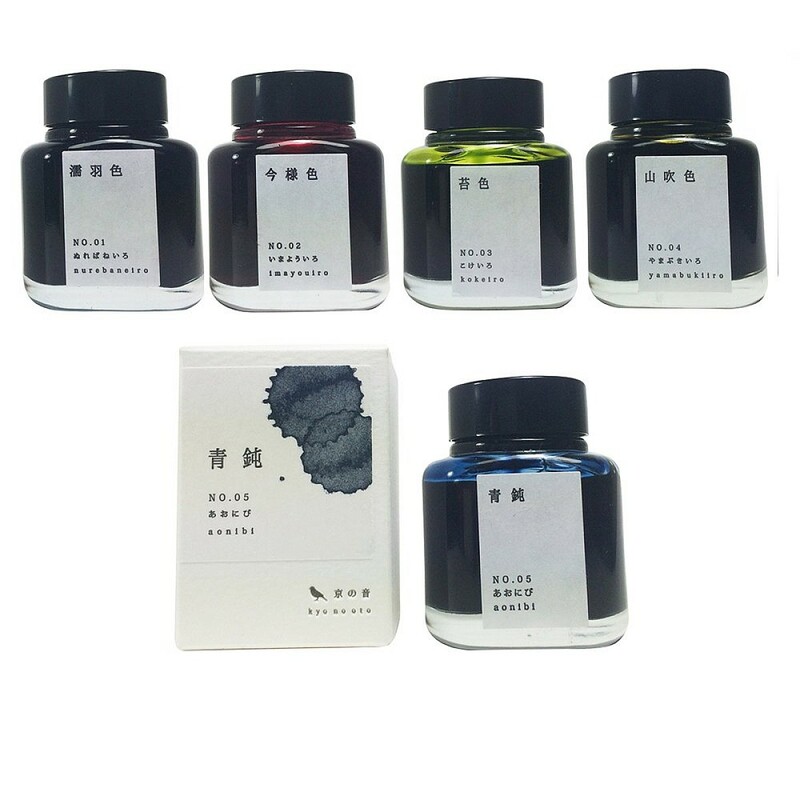 The water-based Kyo-no-oto fountain pen ink comes in 5 different colors in 40ml ink bottles. Nureba-iro has been used for the name that represents a women’s glossy black hair just like feather of crow. Koke-iro was made being inspired by one of the Japanese aesthetics ‘Wabisabi’. It is located in the garden of Kyoto with the glimpse of culture of Kyoto. Yamabuki is the plant rosaceae kerria genus. This color means a brilliant red tinged gold just like Yamabuki. This color has been used since ancient times. Moon floating in the dark sky, the Kyoto city with silent moonlight. Aonibi is the combination between pale black and indigo. It represents dignified atmosphere in the deep pale night sky.